In May of this year, I presented a section of my masters paper at the University of Massachusetts conference, “High-Tech Heritage.” The theme of the conference was to examine how the past has long been studied through sequential chronology, geographical and spatial dimensions, and literary narrative. It was argued that in today’s world, the lenses of the digital technologies are disrupting this flow and instead focused on magnifying, enhancing, expanding, or even (as some argue), distorting the contemporary understandings of the past. While, 3D visualizations, complex databases, interactive websites, social media, and Geographical Information Systems allow us to record, analyze, disseminate, map, and interpret information about cultural heritage, it has also led to a new means of envisioning past cultures, eras, and landscapes in a virtual, non-spatial, non-narrative immediacy. During the course of the three day conference, there were countless fascinating papers given that addressed these very issues and questions. However, one lecture in particular struck me as not only using technology to magnify the past, but also to help gain a better understanding of it. The lecture was given by Fenella France, lead scientist for preservation at the Library of Congress. 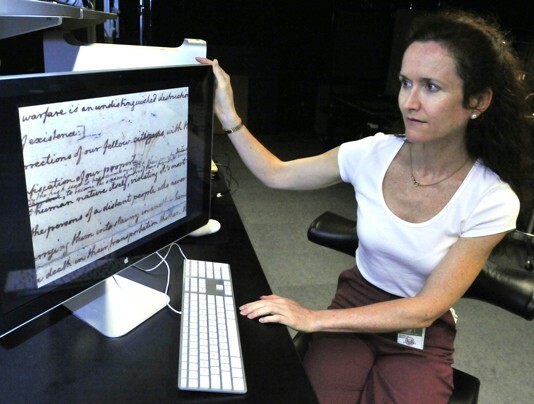 In her paper titled, “Advanced Digital Spectral Imaging Technologies: Rewriting, Reinterpreting, (Un)restricting the Cultural Past” she examined Thomas Jefferson’s rough draft of the Declaration of Independence. 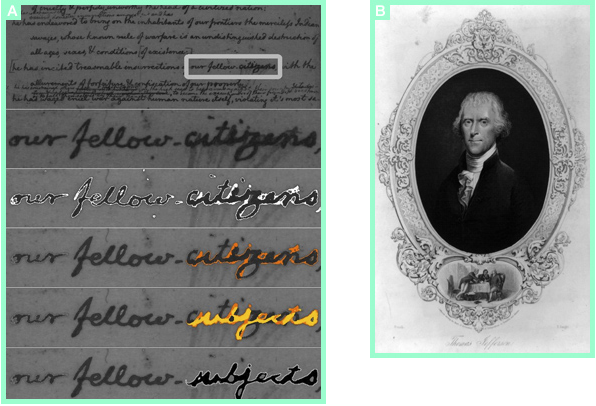 She discovered through hyperspectral imaging in 2009, that Jefferson made an interesting word correction during his writing of the document. Jefferson originally had written the phrase “our fellow-subjects.” But he apparently changed his mind. Scribbled over the word “subjects” he instead wrote an alternative, the word “citizens,” (see above image).